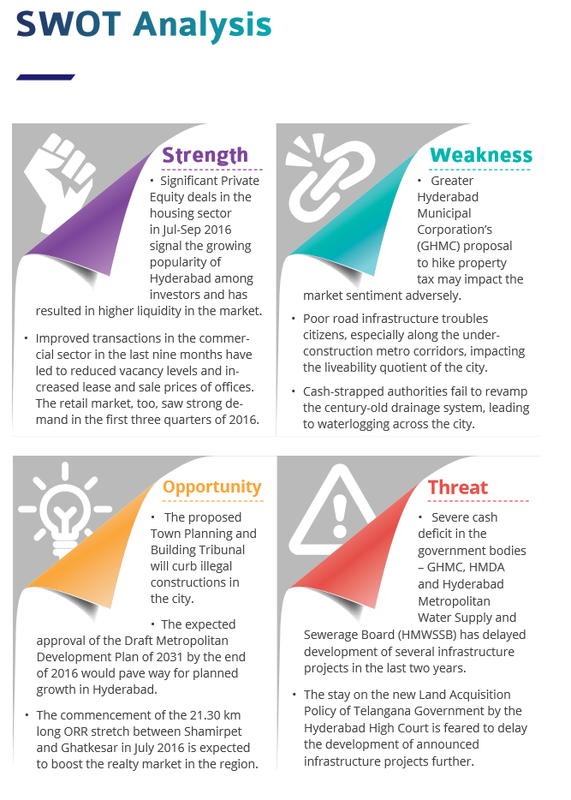 Thriving on political and economic stability, proposed infrastructure projects and progressive policies, Hyderabad showed signs of recovery in Jul-Sep 2016. Nagole emerged as a top grosser with five percent hike in average weighted values. Setting up of new industries, proximity to commercial hubs of Uppal and MP Nagar, connectivity by metro, improved road transport and availability of affordable properties fuelled growth here. West Hyderabad continued to be the hub of affordable homes. Narsingi recorded four percent growth, QoQ, owing to development of cemented roads and underground drainage system. Restricted commercial growth due to lack of quality office spaces led property rates in HITEC City and Miyapur dip by five and three percent QoQ, respectively. Mirroring the growth witnessed by residential apartments, plotted developments in the city recorded a four percent growth, QoQ. State government’s focus on completing the Outer Ring Road, Inner Ring Road, expressways and arterial roads contributed to the growing popularity of the housing hubs around the highways. With the state government planning to build three bridges on Krishna River to connect Hyderabad and Amravati, Nandigama registered an exponential rise of 14 percent in land prices in this quarter. 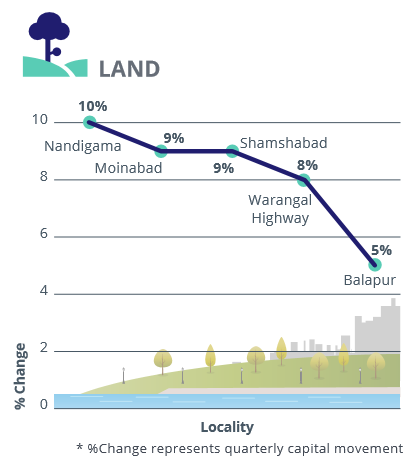 Balapur, Warangal Highway, Shamshabad and Moinabad recorded a growth in land values by five to nine percent, QoQ. The areas grew on the back of establisment of 13 IT/ITeS zones in neighbouring areas. Hyderabad’s rental market continued to flourish, recording an eight percent rise in ‘ask’ rates, YoY. A healthy uptake of commercial and retail spaces enhanced demand for rental properties. Proximity to commercial hubs pushed rental rates in Madhapur, Kondapur, Nizampet, Chandanagar, Manikonda and Madinaguda by 11-22 percent, YoY. 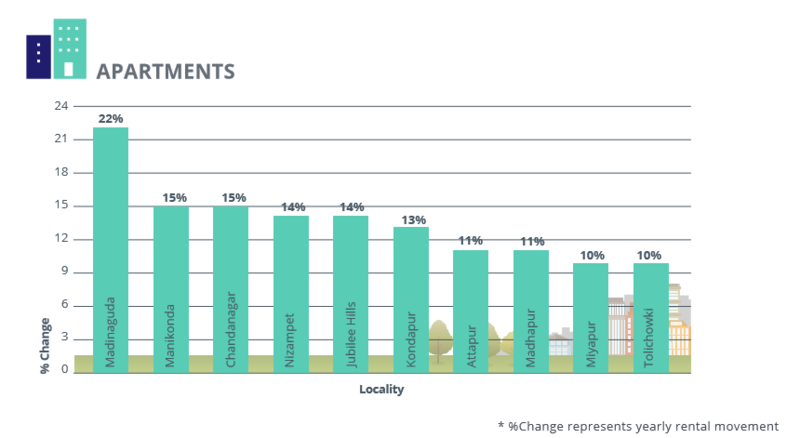 Despite exorbitant rents, tenants preferred these areas due to vicinity to workplaces. 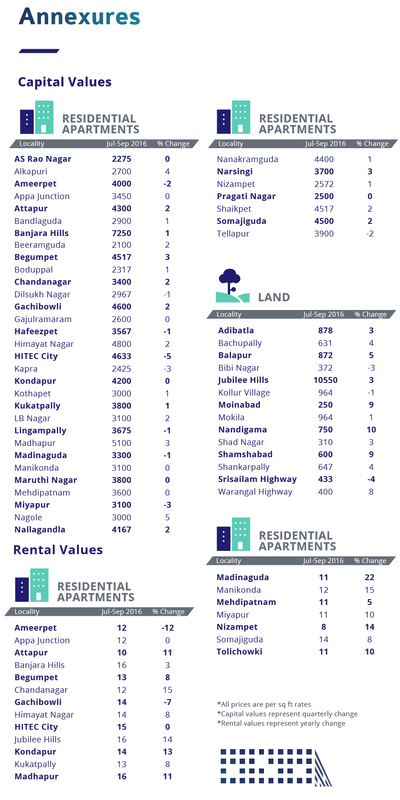 Tolichowki, Attapur, Miyapur and Jubilee Hills too, recorded a rising rental graph. Steady water supply and self-sufficient physical and social infrastructure resulted in consistent demand for rental properties in these localities. Somajiguda in Central Hyderabad recorded an eight percent rise in rental values, YoY. Its proximity to commercial hubs such as Ameerpet, Banjara Hills, Jubilee Hills and Begumpet worked in its favour. Other major growth stimulators include seamless road connectivity and nearness to the upcoming metro station at Ameerpet. Rental rates in Gachibowli and Ameerpet dipped by seven and 13 percent, respectively, YoY. While Gachibowli was gripped by severe water crisis and poor civic amenities, Ameerpet suffered on account of persistent civic issues of garbage disposal and poorly-lit streets. The recent downpour added to the woes of the two localities as cracked roads and open potholes dampened market sentiments. 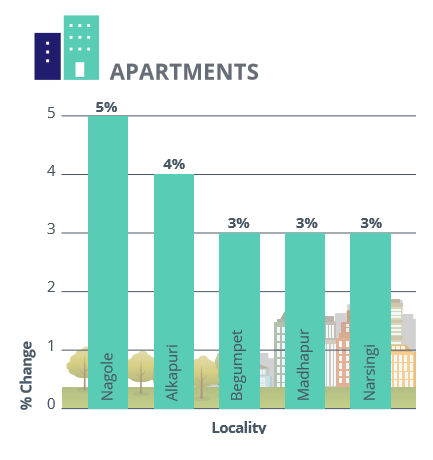 While tenants refrained moving to these localities, vacancy levels rose in both Gachibowli and Ameerpet. Hyderabad is witnessing improved real estate transactions, especially in the western quadrants of the city. Ready-to-move-in properties in the mid-income housing segment continue to rule the roost and record significant absorption. Demand for residential apartments firmed in Jul-Sep 2016 with nearly half of the homebuyers preferring the same. Its supply was equally strong. Nearly one-third of the inventory of apartments was available within Rs 40-60 lakh. Demand for plots and houses/villas dropped significantly in the last three months. Driven by end-users, the city has limited buyer base for land. 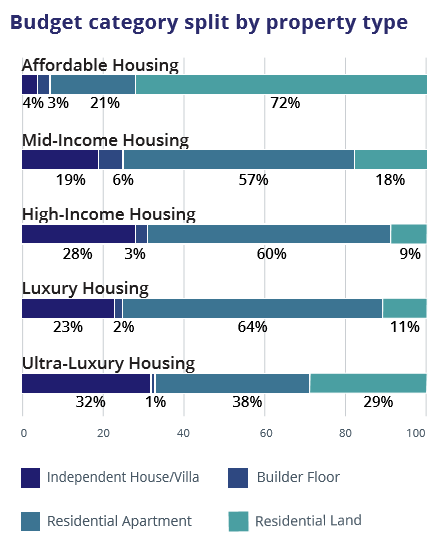 Residential houses are also unpopular due to exorbitant price tags and limited amenities. 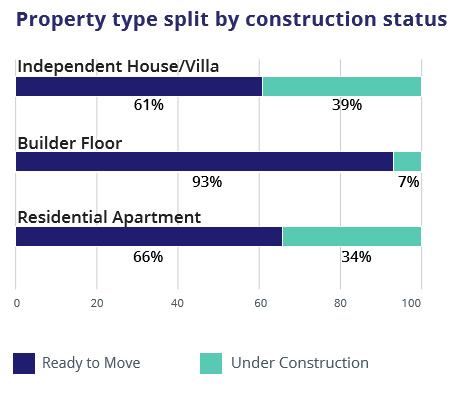 Not surprisingly, residential land and houses witnessed limited new launches, depicting developers’ focus on constructing apartments. Barring high-income housing, all other budget categories recorded a mismatch in demand and supply. While there was an augmented demand for affordable homes (within Rs 25 lakh), its supply remained low. Low profit margins kept developers from lowering property prices and foraying into this category. Luxury housing and ultra-luxury housing segments, on the other hand, continued to be over-supplied. Premium market in Hyderabad attracts very few buyers and investors, disbalancing the demand-supply equilibrium. Limited number of new launches and burgeoning sales have led to faster absorption of residential inventory in Hyderabad. 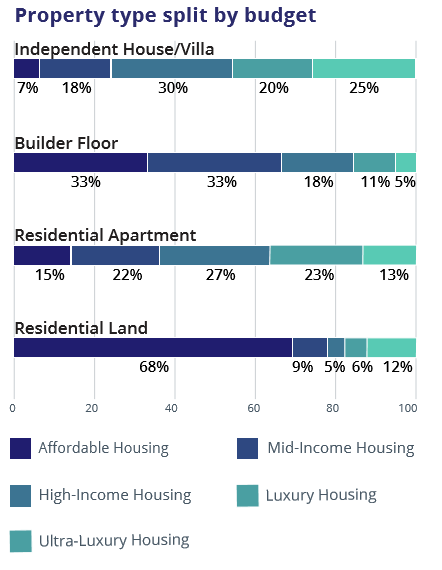 Maximum transactions are reported in the mid-income and high-income housing segments. Hyderabad witnesses meek demand for 1BHK units. The last three months, however, recorded a significant rise in its requirement. Inflating property prices, especially in the western quadrant of the city, has forced homebuyers to look for smaller property format. The supply of 1BHK units, however, remained negligible. 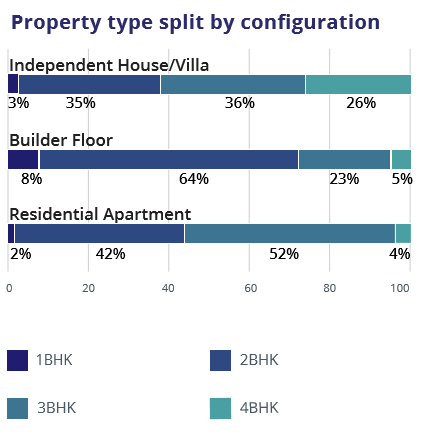 Similarly, 2BHK units continued to be a popular choice amongst half of the homebuyers. Its supply, however, fell short of its demand. The category recorded a disbalance in demand and supply to the tune of 12 percent. Barring those located near the IT hubs, majority of the 2BHK units in Hyderabad are available in the mid-income housing category. The 3BHK category continued to be the most supplied segment in the city. Its demand, however, remained frail. Nine out of ten homebuyers in Hyderabad preferred ready-to-move-in properties. Though the supply of ready projects remained in line with demand, it failed to meet the city’s appetite. The city recorded a demand-supply gap of 10 percent in the current quarter. Majority of the ready projects in Hyderabad are available in the central and the western quadrants. The city continued to witness a dearth of investors. While those who have already invested are looking to liquidate their investments, others are waiting for the market to gain momentum. 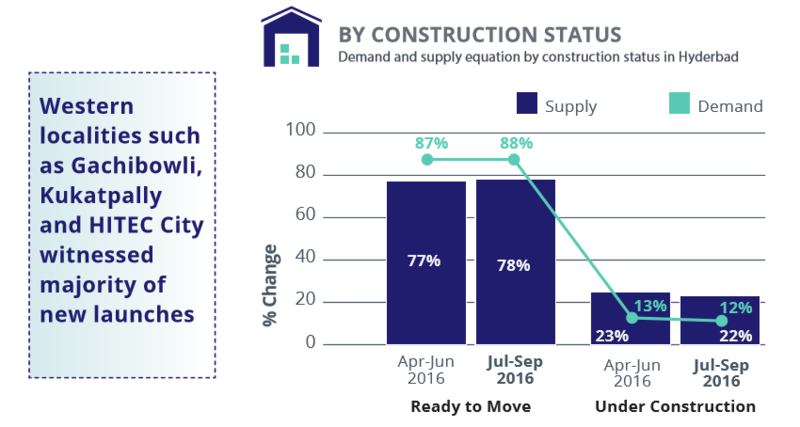 This impacted the demand of under-construction properties, which largely recorded an over-supply. New launches were largely reported in the North and West zones of Hyderabad. Majority of these were available in the budget bracket of Rs 40 lakh to Rs 1 crore.